Google Maps contains a fantastic amount of information about the world around us, cataloging not just the streets that criss-cross nation after nation, but also tons of detail about all the interesting places you'll find along those routes: stores, restaurants, theaters, parks, and more. When you're looking for one those particular destinations, it's easy enough to find with the help of the app's built-in search tool (and start planning how you'll get there). But that's not always how we go about looking for places; sometimes we'll already be on our way headed somewhere else, and are interested in quickly swinging by to pick up something we forgot to bring, or stopping for a bite. Now Google's making those kind of extra stops as easy for pedestrians or bicyclists as they have been for drivers, with the latest update to Google Maps for Android. In those cases we just described, convenience is key, and we don't want to be going really out of our way and getting off-track from out main route. 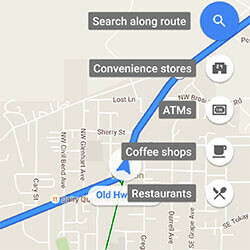 That's why last year Google Maps introduced a search-along-route option that could help you find things like gas stations or cafes while on another trip. It was a welcome addition, but the feature had one major limitation: it only worked in driving mode. With Google Maps v9.26.1, the app corrects that oversight and allows users to do the same thing while bicycling or on foot. Beyond that improvement, the new app makes a few minor UI changes, and adds an option to deliver notifications to let you know about popular places (or those that have been recently added to Maps) that are in your local area. A closer look at the app also helps shed some light on possible upcoming features that Google's already started laying the groundwork for, but has yet to implement. Those include an offline mode extension that could preemptively warn you when you're about to travel through an area of poor cellular coverage and could benefit from loading those maps to your phone in advance, and a “Discover” tool that would offer destination suggestions based on your usage history. There's no saying when those in-development features might be ready to go live, but text strings in the new Google Maps app sure suggest they're on their way. Damn, Google maps is just getting better and better all the time! Nice one there Google! ALWAYS wondered why we couldn't search for stuff along the route before.. and when they FINALLY implemented it last year i couldn't have asked for more. you can search for anything along your route and it'll resume after you're done getting some donuts! But their POIS are very poor. In the housing estates near me Google is showing several shops that have never been there. The most likely thing is that they have taken UK company data and put the director's address, or the registered office rather than the operating address. I've reported it to Google and other satnav companies that use their data, but it remains a year later. So, am I delighted to learn that I will have such locations shown to me while driving? Hell, no.